I have so many memories, most of which are best narrated in person. This is a blog. I’m typing. So my theatrics are greatly missed out on. 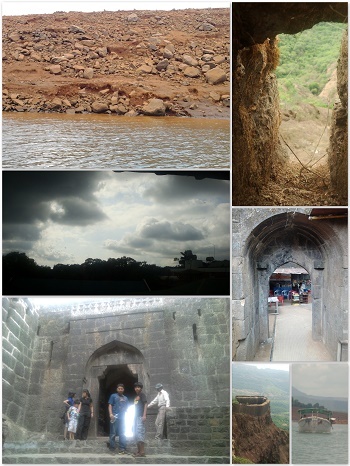 This picture along the side, is a rather sad looking mini collage of a lively trip that Mahabaleshwar was. I’ve written about it previously ( Mahabal(ol)eshwar,) and if you read it, you’ll know how one aspect of the trip was a total laugh riot. Well here’s the other scenic aspect of it.. these pictures were taken on the same day. (there could’ve been many more, but my camera battery gave way half way through, and these were the few good ones I took from time to time) We took a boat ride in the venna lake, and scaled the Pratapgarh fort. Every step of the Pratapgarh fort, all of us young blooded enthusiasts, kept telling ourselves, we’ve got to start hitting the gym big time. (which are about 450 of them, steep rock cut stairs) oh. Dear. Even though the guide who overcharged us for a walk through our school level history lessons, did occasionally stop and let us catch our breaths, we were literally fighting for breath by the end of it. If you thought scaling up the stairs was tough, the walk down was equally tough. We did rest, though, not for as long as we should’ve. It took us around 2 ½ hours, and we were a bit rushed. (if you ask me, I’d have taken the entire day, just to explore the fort and let it overwhelm me.) We all had a collective adrenaline rush and were all waiting to go check out the next place, or go back to the hotel, because we went there around the early monsoon, and this was going to be a downpour. We made it back just in time. The drizzle had already begun. Halfway through, it was raining too heavily to drive without being scared for our lives, so as soon as we found a nearby sham of a café, we went for it. And ordered some nice warm fuzzy goodness that tea and coffee are. Me on the other hand, totally stupid. I called in for a fresh lime soda, knowing very well that lime and cool climates are not a good combination for me. It was good though, because I didn’t have to worry about health problems after. And we didn’t pay the 45 Rupees of the printed amount, but only 6 Rupees, which is the actual cost of one sachet! And that too, because we’d spotted the hoax, and confronted the dude about it, and he cheekily says something to the effect of – we ran out of lemons, so please make do with this.